Are you tired of scraping and painting your home? Give Geske Home Improvement Company a call. We can give you a new home at the same address, forever! With a variety of colors and profiles to choose from, we'll give your home's exterior a unique beauty, with a lifetime of quality, satisfaction and peace of mind. 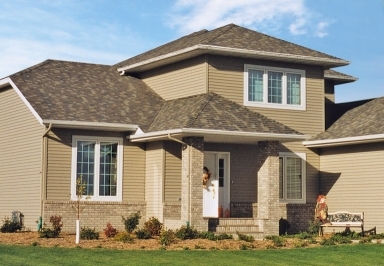 Our seamless steel siding is the right choice for your home's exterior. You'll never have to paint again. Installing seamless steel siding on your home will generate dollar savings in energy costs, reduce outside noise, virtually eliminate exterior maintenance, and increase your homes' resale value. Surveys show that 95 to 100 percent of steel siding costs are recovered when the home is sold! With seamless steel siding you can see and feel the difference. We are so confident in our products and installations, that we offer the best warranties in the business. The guys at Geske's work hard at being the best! Your home is your most valuable investment, so why settle for less than seamless steel siding from Geske Home Improvement Company. We offer seamless steel siding in several profile options. With Geske Home Improvement Company you can be assured your homes' exterior will look beautiful and last a lifetime. Our craftsmen are factory-trained professionals and our product speaks for itself. Call us today for a free, in-home, no obligation estimate at 507-532-2811.